Driving down operating costs ranks as the top business challenge in a global executive survey from KPMG, but leaders overseeing the numbers view a bigger challenge – enabling digital transformation. According to KPMG’s 3Q 2018 Global Insights Pulse survey of 1,000 executives worldwide, finance and accounting decision-makers see a challenge in understanding, investing in and exploiting new technologies that enable digital transformation. These include intelligent automation, data and analytics, blockchain and the Internet of Things that are reshaping many business functions. The survey also notes that redesigning so-called “target operating models” (desired operating states); talent pools and talent management strategies; and improving governance, risk and compliance capabilities remain the tops ways to deal with the challenges cited above.In addition to how best to enable digital transformation, the perennial existence of legacy systems and the wide number of available technology solutions remain the top technological challenges to organizations.The survey found that the following approaches could help deal with or solve some of the challenges. In addition, companies will need to upgrade their talent pools with the skills and capabilities to carry out these efforts, and become more strategic rather than simply transactional in their approaches to businesses process, the survey report noted. 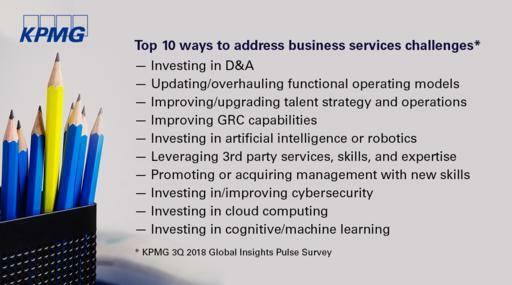 Pulse Surveys are KPMG’s quarterly look at Global Business Services (GBS) and intelligent automation related market trends. To view the full survey results, click here. Follow the conversation at #globalinsightspulse @KPMG_US @KPMGUS_News. The survey was conducted among more than 1,000 KPMG professionals in 154 countries and sought to identify to the latest trends and technology developments of Global Business Services (GBS), Intelligent Automation and the service delivery market. It includes observations by professionals in the firm’s Sourcing Advisory Services, Financial Management, Technology, Human Resources, Customer & Operations and other practice areas. KPMG regularly conducts global surveys to identify and interpret key market conditions, trends, and leading practices in how organizations use shared services, outsourcing, and third-party business and IT services. KPMG is one of the world’s leading professional services firms, providing business solutions and audit, tax, and advisory services to many of the world’s largest and most prestigious organizations. KPMG LLP is the independent U.S. member firm of KPMG International Cooperative (“KPMG International”). KPMG International’s independent member firms have 197,000 professionals working in 154 countries. Learn more at www.kpmg.com/us. LED Lighting Market Size Worth $108.99 Billion By 2025 | CAGR 14.4%: Grand View Research, Inc.